Orders to trade addresses within mainland UK with a value of under £1,000 excluding VAT will be subject to a carriage/handling charge. The £1,000 value applies to furniture items only and does not include fabric or leather supplied by us, interlining, or sundry items (i.e. armcaps and scatter cushions). The method of delivery will be at the discretion of the company and will be a one man (driver only) service to trade addresses only. It will be necessary for someone to assist the driver with offloading and carrying to site. For orders over £1,000 (excluding VAT), delivery is free of charge to trade addresses within the UK mainland. For orders under £1,000 (excluding VAT), the delivery cost is £25 per seat place, with a minimum charge of £50 for large items such as sofas, chairs, chaise longues, upholstered beds and large headboards. Smaller items (scatter cushions, footstools and small chairs) can be delivered by parcel courier. The delivery cost is £20 per parcel. All legs will be sent separately to avoid damage and will need to be attached by the Purchaser. Trade deliveries to Northern Ireland, Other UK Islands, Europe and The Rest of the World are also possible. Please contact us for a delivery cost and lead time. We can arrange a two-man delivery direct to your client/customer through our various delivery partners. Minimum charges apply and the cost is dependant on the delivery location and the carrier. Please contact us directly for quotations. Higher delivery charges and a longer delivery time should be allowed for the following areas: English Postcode TR. Scottish Postcodes AB, DD, FK15 onwards, G63,82,83,84, IV, PA15 onwards. PH, KW and KY are classed as within the Highlands & Islands of Scotland. Please contact us for a delivery cost and lead time. To contact us with a delivery query, please fill in your details here. For prices and a lead-time for a delivery to a specific address, it will be helpful to provide us with your exact delivery address, including postcode. 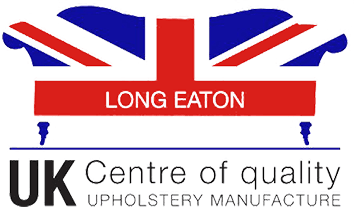 PF Collections Ltd are proud members and supporters of the Long Eaton UK Centre of Quality Upholstery Manufacture initiative. © 2019 PF Collections. All rights reserved.